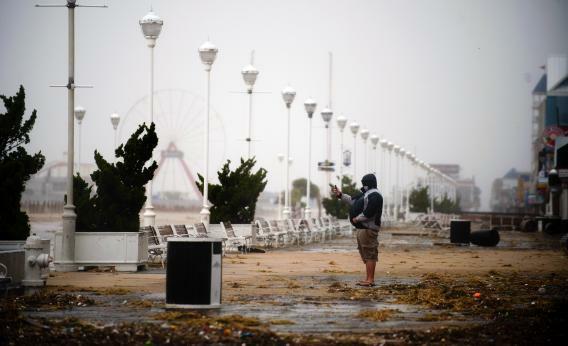 Hurricane Sandy demonstrated how resilient the cellphone networks now are. Like most people on the East Coast, I spent Monday night hunkered down with water to last me a couple of days and a good supply of food that wouldn’t need cooking. After the sun set, I drew my drapes, moved away from the windows, and watched the storm electronically. I wasn’t alone in that, either. Hundreds of thousands of friends, strangers, and government officials exchanged links, photos, rumors, warnings, and corrections about the progress of the storm on sites like Instagram, Facebook, Tumblr, and Twitter. Amid the updates about flooding, fatalities, and fine wine opened to pass the time, there appeared a strange phenomenon: people tweeting to say that their power had gone out. While millions went without power, signal failures were few and far between, relatively speaking. As whole neighborhoods went dark, mobile phones stayed online, allowing us to exchange Internet telegrams while chaos howled outside. This is new. It’s not that long ago that cell networks went down first, not last. On Sept. 11, 2001 the cellular networks failed almost completely in New York, overwhelmed by traffic and damage. In the wake of that disaster, you couldn’t even send an SMS message to a loved one on a different mobile network—that capability didn’t start to come online in the United States until November 2001. Compare that to the NYC Mayor’s Office, which asked people to use SMS whenever possible, in order to alleviate pressure on the phone lines. This change has been the result countless refinements to the cellular network infrastructure, made in response both to a string of disasters that have tested the networks and to an explosion in people reliant on cellphones. In the intervening decade, mobile carriers have been hard at work, building bandwidth and hardening their installations. You can catch a glimpse of the extent of the network in this Gizmodo post tracing the path of a multimedia message from phone to phone. Perhaps the most important improvement to have been made was switching the towers from reliance on the electrical grid to batteries, which are in turn recharged from municipal power or on-site generators in the event that the grid goes down. At Quartz, Christopher Mims traces this push for backup power to the collapse of the network in New Orleans after Katrina in 2005. What’s striking about the cellular network’s rise to resilience is how quickly it happened. In 2001 in New York and again in 2005 in New Orleans, cellular providers failed. In 2012, they did pretty well. There’s a lesson here. The infrastructures and batteries (both large and small) that allowed post-power tweeting are a tiny wonder. They’re also a good lesson for the future of energy. One common criticism of technologies like wind and solar power is that they are irregular providers of electricity. This is a problem only because we’ve created a civilization of appliances, machines, and cultural practices that very much depend on a constant stream of power. Anyone who uses a laptop or mobile phone is already used to the delicate dance of irregular electricity, sipping power when they can, running down the batteries when they can’t. This is generally seen as an improvement over the alternative of always being plugged in. Our increasingly resilient cellular networks ,which put a buffer between themselves and an unreliable world, offer another glimpse of how that might work. Fuel delivery services like oil and gas, which rely on storage tanks—to say nothing of disused coal chutes and bricked-up fireplaces—remind us that irregular access to energy has been the norm for a long, long time.